I have been advocating for wind power for decades. I never thought I would see the day when I would be opposing wind power development. However, the current frantic rush to install industrial wind on every viable mountaintop is both shortsighted and ecologically damaging. All one has to do is look at the impact of the Kibby TransCanada industrial wind operation in the remote Boundary Mountains of western Maine. This is nothing more than industrial wind mountaintop removal. It is being driven by dollars and cents, not ecological sense. To call mountaintop wind operations “farms” is nothing more than PR. Farms suggest a positive relationship with the land. The industrial wind operations are nothing less than massive electrical generating facilities that destroy the quality of place and pose serious health problems for both humans and wildlife. 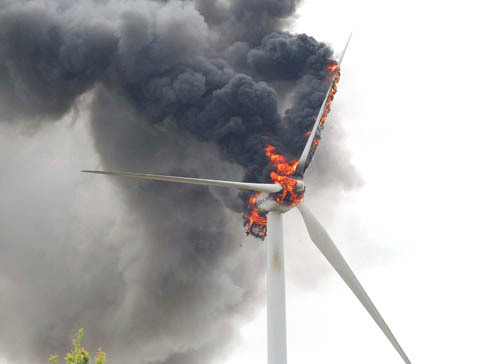 When John Baldacci announced the formation of the Governor’s Task Force on Wind Power, I thought, “good idea John”. Never in my wildest dreams did I think this task force would submitted to the legislature an Expedited Wind Permitting Law which fast tracks industrial wind development in an area covering two thirds of the state. This bill was passed by the legislature in fifteen days with little to no public involvement or debate. The fact is that the Expedited Wind Law was to a large extent written by the wind developers whose primary interest is green money not green energy. This law gives the go ahead for potentially 360 miles of industrial wind turbines on Maine mountaintops. This would result in the building of thousands of miles of additional power lines and roads. It would require the clearcutting of over 50,000 acres of carbon sequestering forestlands. Literally the tops of the mountains are blown-up in order to establish a bedrock base for the massive concrete pads need to support 400 to 500 foot turbines. In addition to the destruction of habitat, these massive wind machines, which individually moving at over 180 miles an hour sweep an acre of space, broadcast high volume sounds which have literally driven people in Maine from their homes. It is not only audible sounds which cause a problem to people and wildlife, but probably more damaging are low frequency sound waves that are emitted from these industrial power plants. It is well documented that the low frequency sounds and shadow flicker, which can travel miles from the turbines, pose serious health risks. The neurological health problems have been labeled as Wind Turbine Syndrome (WTS). People experiencing WTS can exhibit elevated heart rates, memory problems, visual blurring, nausea, sleep disturbance, and chronic headaches. The proposal by Independence Wind for the Highland Mountains is a perfect example of how the new Expedited Wind Law will open the doors for wind developers to destroy the essence of a rural community by turning the mountains of Maine into something more analogous to Portland Jetport. The Highland Mts are right next to the Bigelow Preserve. This development would undermine the wildness character of hundreds of miles of the Appalachian Trail. The whole Bigelow Range would be confronted with, upfront in your face, a string of 49 turbines with their noise, shadow flicker, and flashing red lights. The Kibby industrial wind facility to the north and west of the Highland Mts. has already reduced the value of remote real estate and destroyed the tranquility of many camp owners who now view “Portland Jetport ever night”. If you like to hike, hunt, or fish, do you honestly think your experience is going to be enhanced by the high decibel sounds, the shadow flicker, and flashing red lights of turbines? North Carolina has put a moratorium on mountaintop turbines because they recognized that turbines would degrade the mountains, which define their state and are a major economic driver in the form of tourism and outdoor recreation. What has Maine done? It has passed an Expedited Law that will fast track industrial wind mountaintop removal. In defiance of the Migratory Bird Protection Act, turbines routinely kill birds and bats The Highland Mts area is home to many Bald Eagles, the rare Bicknell Thrush, and the threatened Canada Lynx. While we certainly know that turbines kill bats and birds and that a string of turbines is going to destroy habitat, little research has been done on the impacts of low frequency sound on wildlife. We know it causes WTS in humans, but what does it do to wildlife  does it impact reproduction, fertility rates, feeding behavior etc? It would be prudent to find the answers before rather than regret the outcome later. Some environmentalists have been drawn into believing that if you are not for covering the mountains of Maine with wind turbines, then you are acting against the unfolding disaster of climate change. This is a false dichotomy. Global warming is a catastrophic crisis, but the solution is not to destroy the pristine character of the Maine Mountains. The industrial wind mountaintop frenzy sweeping across Maine is not tied to shutting down an oil or coal power plant. It is simply feeding our gluttonous consumption of more and more energy. It makes no sense to destroy our mountaintops to feed this appetite. There are better alternatives  the first being CONSERVATION. It is no secret that if the federal subsidies (as much as 60% of cost) being poured into industrial wind were invested instead into efficiency and conservation projects, the reductions in carbon emissions would dwarf those potentially created by mountaintop industrial wind. It would also create thousands of more jobs for local communities. If these funds were used for forest restoration the reductions per dollar expended would be even greater. Maine, a state with one of the highest renewable energy portfolios, already produces more than enough energy. In fact, we export energy. It has been estimated that Maine and the rest of New England will have excess capacity for the next fifteen to twenty years. It is clear that the right choice for Maine is offshore. This is where the best winds are, where turbines can be placed out of sight, and, in general, where the least amount of environmental damage will occur. Norway is already pursuing offshore with great success. In addition, residential and community based wind projects hold a lot of promise. At a local or community scale turbines are much smaller, emit a lot less sound, have reduced shadow flicker, do not require flashing red lights, are less damaging to migratory birds, and, if placed properly, will not destroy fragile habitat. It is time to take a step back from industrial wind power mountaintop removal and to develop an energy policy that is not simply driven by the huge profits to be made from federal subsidies. If we allow this mountaintop wind gold rush to continue, after the rush has played out Mainers will be left with the tailings of a despoiled landscape and the magic of the mountains gone forever.